NORWALK – Several Cerritos College faculty members, with vocal student support, attended last Wednesday’s Trustee meeting in protest of what they are claiming to be unfair wages and working conditions. Solomon Namala, co-chair of the Cerritos College Economics Department and Cerritos College Faculty Federation (CCFF) President said that negotiations have not been going well. The Faculty Union is fighting for higher pay, expanded office hours for both part-time and full-time staff, fair compensation for other activities such as serving as department chair, offering more classes, and reduced class sizes. “That statement by Cerritos College that faculty is asking for a 30% salary increase is absolutely false. We have presented a copy of our proposal, so the facts speak for themselves,” said Namala. According to Lefebvre, the group was trying to complete a three-year salary deal. The last two years, the College offered 2.5 percent. Namala commented, “There are couple of issues here. First, our part-time faculty is the lowest paid in the area, if they were working full-time at those wages, it would be barely above poverty level. Namala gave HMG-CN documentation that outlined part-time salaries for a neighboring district, El Camino College. The documents showed a difference in hourly pay of over $20 per hour. The documents also showed that El Camino faculty move up in pay increments much quicker than Cerritos. 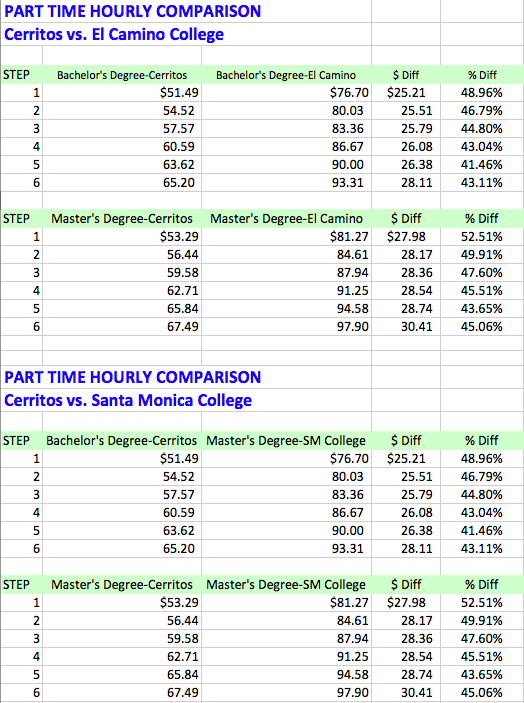 Hourly wage graph showing difference between Cerritos College part-time faculty pay, El Camino College and Santa Monica College pay. The average difference is 45%, the College is offering 16% total over the next three years. Several people spoke in protest at the Trustees meeting.